Yard Signs have quickly become America&apos;s #1 advertising tool. 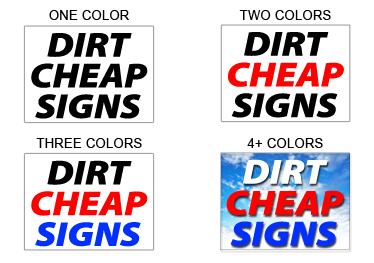 Whether you&apos;re advertising for your Business, School, Social Club, Church or Real Estate, nobody beats Dirt Cheap Signs® when it comes to Yard Signs. You can choose to Design your signs with our Online Designer or select a pre-designed Template from our library and make what changes you need. Available sizes: 18"x24", 12"x18", 9"x24", 24"x18", 18"x12", 24"x24", 24"x36", 36"x24"
18"x24" 12"x18" 9"x24" 24"x18" 18"x12" 24"x24" 24"x36" 36"x24"
We offer many different yard sign sizes. The most common size for real estate signs, bandit signs and political signs is 18x24. 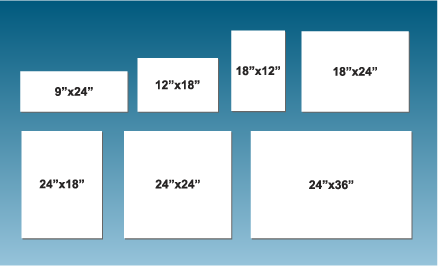 We can go as small as 12x18 and as large as 24x36. 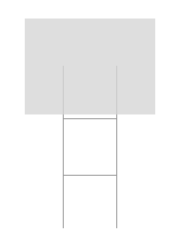 The image below shows the comparison of our available sizes. Corrugated plastic, also known as coroplast or correx is the most common material yard signs are printed on. It is lightweight and tough enough to be outside for years and can be recycled when being thrown away. The plastic is structured with “flutes” that run either vertical or horizontal. The flutes are the holes that you slide the wire h stakes into. When ordering your signs, it is important to order the correct flute direction. If you are using the wire step stakes, you will need to order the vertical flutes. If you plan on putting your signs up using wooden stakes, trees or telephone poles, we suggest you choose horizontal flutes. The horizontal flutes will not bend as easily when using the wooden stakes or poles.